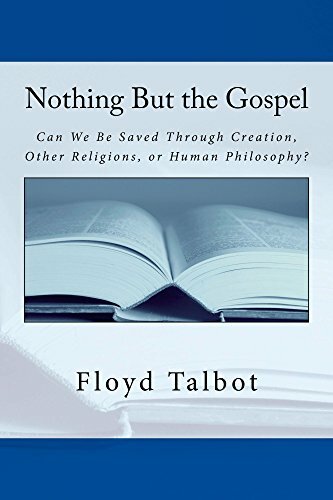 Can We be Saved through Creation, Other Religions, or Human Philosophy? Today’s Christians live in a religiously pluralistic and diverse environment. Pluralism is a hot topic in our post-modern society. That is, we receive pressure to be all-inclusive and to embrace diversity. This pressure does not stop with culture or race. Religious pluralism is also included in this list. Such pluralism suggests that we should be accepting of other religions and their teachings as well as embracing more than one way to God and His salvation. Otherwise, we are labeled intolerant and narrow-minded. However, must we accept this mindset? This book tackles these challenges. 1.Exclusivism – One who does not know God must encounter the proclaimed gospel to come to a saving knowledge of him. 2.Inclusivism – Those who have never heard the gospel can come to a saving knowledge of God without hearing the gospel. Rather, they can go to heaven by responding to the light from creation, other religions, human reason, or philosophy. One of the major consequences of these two positions concerns the person and nature of God. This book engages in a lengthy discussion about how each position treats God and the difference such treatments of Him make. For anyone wanting a deeper understanding of their approach to Scripture, this book provides it. It is a wonderful collection of essays on biblical interpretation, development of teachings on Scripture, tools for approach to them, and articles from other authors concerning them. Although written to those with familiarity of the history and background in Scriptural interpretation and the various approaches to Scripture over the centuries from the first century, it offers anyone interested in knowing about Scriptural development a sound education concerning their use and historical development.